The brothers behind the immensely popular Banchory Beer Festival are spreading their wings with a new event in Donside. Beer @ The Barn @ Lochter, organised by Mungo and Guy Finlayson, will be held on Friday and Saturday, April 22 and 23 (2016) at the Lochter Activity Centre near Inverurie and just a mile from Oldmeldrum. The mini-festival will feature beers, ciders and spirits from a host of Scottish and nationwide breweries and distilleries including the first Scottish rum, Dark Matter and Aberdeen’s Porter’s Gin. Tickets for the event are now on sale and can be purchased from www.inveruriebeerfestival.com. There are less than 1000 tickets available, priced at £15 plus booking fee. There are three sessions over the weekend starting on the Friday (22 April) at 6pm until midnight. The festival will return on the Saturday (April 23) for an afternoon session between 12pm and 5.30pm and an evening session from 6.30pm until 12am. 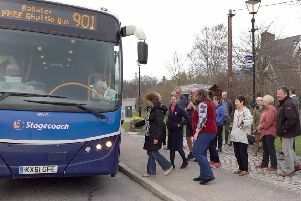 A regular shuttle bus service will be available to take festival-goers from Inverurie town centre to Lochter Activity Park. The bus will run every 30 minutes for the first two hours of each session and by demand thereafter. A return journey can be bought for £6 and a single fare is £4. Mungo Finlayson, co-founder and director of operations at MFGF Events – the organisers of the Banchory and Inverurie Beer Festivals, said: “We are really looking forward to holding one of our events at Lochter. It’s a beautiful and ideal location to hold a mini beer festival. “s and musicians ensuring that those in attendance are having a good time. Lochter will be providing the food which will range from a classic hog dog to gourmet lamb hog roast. The brothers were also shortlisted in the ‘Best Cultural Event or Festival’ category at the Aberdeen City and Shire Tourism Awards, which were held in November 2015 at the Ardoe House Hotel.